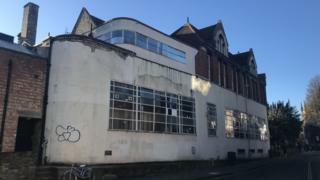 The art deco facade of the building which houses the famous Cambridge Union debating society is to be removed in a £10m refit. The society moved on to the site behind the Round Church in 1866. The facade was added in the 1930s. A survey in 2011 found major structural problems across much of the site. Union president Will Smart said the work would offer "a new lease of life", but the renowned debating room would be unaffected by the renovations. Planning permission was granted in January by Cambridge City Council, but work had to be scaled back after the Union was unable to meet the original £7.2m share of the cost. It will pay £5m towards the upgrade with Trinity College, one of the university's wealthiest colleges, paying the rest. Accommodation for 45 students will be created in a "joint development programme". Extra "performance space" will be created for the Cambridge Footlights comedy group, whose past members include Peter Cook, various members of Monty Python and The Goodies, through to Fry and Laurie, Armstrong and Miller, and Richard Ayoade. Mr Smart said: "The 1930s façade is an ugly, ill-conceived addition... it will be replaced by restoring the original brickwork, so the Union's appearance from Round Church Street will be much more sympathetic to Alfred Waterhouse's design. "This redevelopment will lend a new lease of life to the building and make it fit for the 21st Century, whilst restoring original features that have since been lost." Councillor Kevin Blencowe, of the city council's planning committee, said the work would give "much-needed vitality to a particularly bland corridor of the city centre". The work is expected to be completed by late 2020.